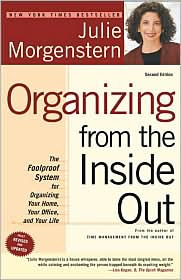 I just completed reading Julie Morgenstern's book, Organizing from the Inside Out: The Foolproof System for Organizing Your Home, Your Office, and Your Life. If you are like me, you probably have read and/or own several books on how to organize. So why read one more? I first read this in 1998 when it was hot off the press (it has since been updated). I remember the wonderful feeling of hope I felt when she described her former messy ways and how she'd broken free from that. At that time, I had 2 kids and I felt as though I was drowning in clutter. Tired from the sleepless nights with an infant and from the incessant cleaning up after a preschooler, I thought my life would never get a handle on the kid clutter. The reader is advised to NOT run right out and buy a bunch of storage containers. By taking time to first analyze your problem areas, strategize solutions and then move in for the well-planned attack, you'll have more likelihood of lasting success. This same strategy works just as well for physical spaces in your house as for non-physical ideas such as organizing your time and technology. The book features four parts. While you may be tempted to go directly to a chapter on a particular room, please resist the urge! Part One of the book lays a critical foundation by tackling misconceptions about organizing and helping you create a system that incorporates your own personal needs, goals and personality. Then it's time for some self-examination looking at the factors that have contributed to your disorganization. She groups these factors into Technical Errors (easily fixed, mechanical issues), External Realities (limiting factors outside of your control) and Psychological Obstacles (battling those interior struggles). You will most likely find several things that have held you back and facing those hurdles will help you clear them. Part Two introduces the reader to some secrets of professional organizers. The Analysis phase serves as a diagnostic test to see where you are today by figuring out what is working and what's not, deciding what things are important to you, determining why you want to get organized and exploring what has been causing your problems. As tempting as it might be to skip these introductory chapters, it really will help the process if you can write down your responses. This also is helpful to refer back to later since most likely you won't be able to read the book cover to cover in one sitting. With some thought and planning, you can create rooms in your house that achieve that same success--creating clearly defined spaces that allow someone to focus on a given activity by having clearly defined boundaries, storage and a place for what's needed. The book provides a number of possible zones in a variety of places. Within the kitchen, you may have a baking or cooking zone, a food storage zone, a dishwashing/storage zone, or a household management zone. By first identifying the zones and then clearly defining those spaces and designing storage at the point of use, your spaces will become transformed into a place that's actually fun and satisfying to maintain because items will have a logical, easily accessible home. As you look at each room in your home or office, grab some paper and list activities, all the supplies needed for that activity, as well as storage available for those supplies. Then before you hit the mall, sit down and map out the space--get out some graph paper and sketch out your activities and where they most naturally occur. In other words, construct your room around the way you and your family live their life. Then for the fun part....do some rearranging. You may have to take an intermediate step of some sorting and purging if the clutter has gotten out of hand. When you can start rearranging things, it will help you see how your zones can function. And then the same principles are applied to Time and Technology in Part Four. On page 213, Morgenstern says, "Time is much more elusive than space and paper. You can't see it or hold it in your hand. It's not something that piles up or that you can physically move around, [however]...Time is measurable and we all get exactly the same amount...therefore, it is not time we need to organize but the tasks we fill it with." I think this is one of the best organizing books on the market. It provides an excellent balance between theory and practice with many, many examples and suggestions. If you take the time to follow through on the planning phases and follow through on the attack, you will enjoy the fruits of your organizing labors. P.S. You can find this book at your library or buy it used through ebay or amazon. If you'd like to preview parts of the book you can check it out through Google. You can also find it on Paperback Swap . Now would be a great time to check out this great book swapping site. If you list 10 books you'd like to swap, you'll get 2 free credits (2 books you can request immediately and will be shipped to you at no cost). If you decide to try the service, let them know that pilgrimsprogress referred you. I read another organizing book that talked about zones and I have my kitchen in zones. My baking counter has drawers with measuring cups, baking supplies, etc with cookbooks on the shelves above. I also have a zone in the bathroom for hair and cosmetic supplies. Now my office...that could use some rezoning. WOW! This book looks amazing! I feel exactly like you felt. Cleaning up after the preschooler and sleepless nights with the baby. My house is a mess. Not dirty - but messy. Papers, clutter. I'm trying to throw, but it seems as soon a I get one thing cleaned up something else falls apart. I have only 2 closets in the house, both upstairs in the bedroom. It feels like everything is right in the living room. I will have to check out this book! Thank you! 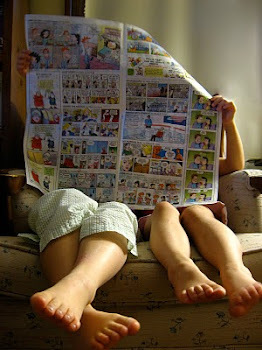 When do you find time to read?